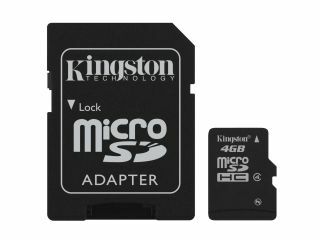 Kingston Technology today announced a range of microSDHC flash memory cards, perfect for beefing up storage on your mobile phone, digital camera or MP3 player. The 4GB Kingston SDC4/4GB microSDHC card is the firm's first microSDHC card and will slot into phone handsets such as Nokia's 5310, 5610, E90, N81 and N95 as well as LG's VX8550, VX8700 and VX9400 mobile phones. The card can hold some 2,000 photos, 1,000 music tracks or eight hours of MPEG4 video. It comes with a lifetime warranty and free 24/7 technical support. It is available now priced at £38.